I find Monday mornings the hardest day of the week to find inspiration in my closet, shoe and regular. For some reason, Mondays are the hardest to shake off the sleep from my eyes to see my wardrobe options clearly and draw inspiration. I tend to default into the less imaginative, fashion forward outfits hovering in the brown or black sections of my wardrobe options. So, you can imagine my delight when a coworker of mine showed up in these fresh jewel tone suede peep toes popping with pizzazz. She paired her pantsuit with a Pucchi inspired printed sheath top that matched these Celine Suede Peep Toe Pumps by Style & Co from Macys perfectly without giving that forced matchy matchy look. Sporting the classic light grey suit never looked so stylish, professional and chic. She admitted to me that she shared my level of motivation for dressing that morning. But this proves that when you have the right accessories, like these pretty shoes, you can pull together a really fashionable look with minimal effort. She told me that she bought them on sale about a year ago. I was fortunate enough to find them online on sale for only $39.99 (http://www1.macys.com/catalog/product/index.ognc?ID=378990&CategoryID=13247&LinkType=PDPZ1). They don’t have the purple but they have the great basic colors of black, navy, red, and caramel. She said that she loved these shoes not just because of their sassy saturated color, but because they are really comfortable shoes she can walk in all day long. 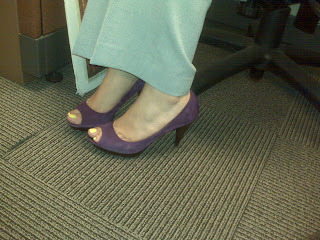 With a 3 ½” heel that has a ¾” platform, they are a really good height for pants. The hemline hits perfectly when standing. They prevent that dreaded dragging of the pant hem on the floor causing you to occasionally step on your pants, a major fashion don’t. It was a great Monday morning surprise to find how much a punch of color can really give a typical pantsuit the polishing touch.